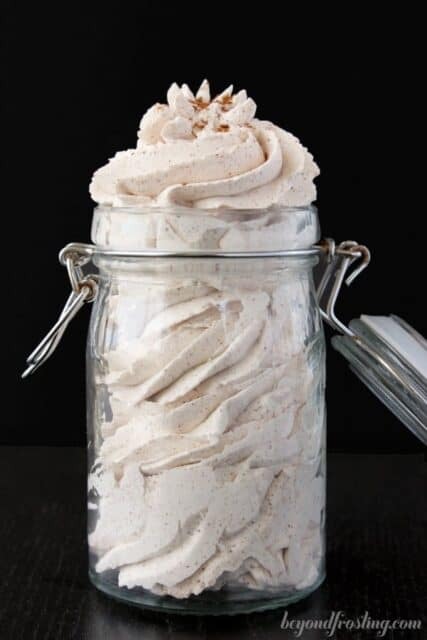 This recipe for Homemade Whipped Cream walks you through tips for how to make whipped cream. The recipe is for a stabilized whipped cream without gelatin. It’s the perfect topping for cakes, cupcakes, pies, no-bake desserts and more. Ditch the Cool Whip and make a batch of homemade whipped cream instead. I make a LOT of whipped cream in my house. Anytime I am making poke cakes, no-bake desserts, pies or even ice cream, I am probably making a batch of Homemade Whipped Cream. Therefore, a lot of my recipes call for a batch of whipped cream whether it’s mixed into the filling or added as decoration to the top. 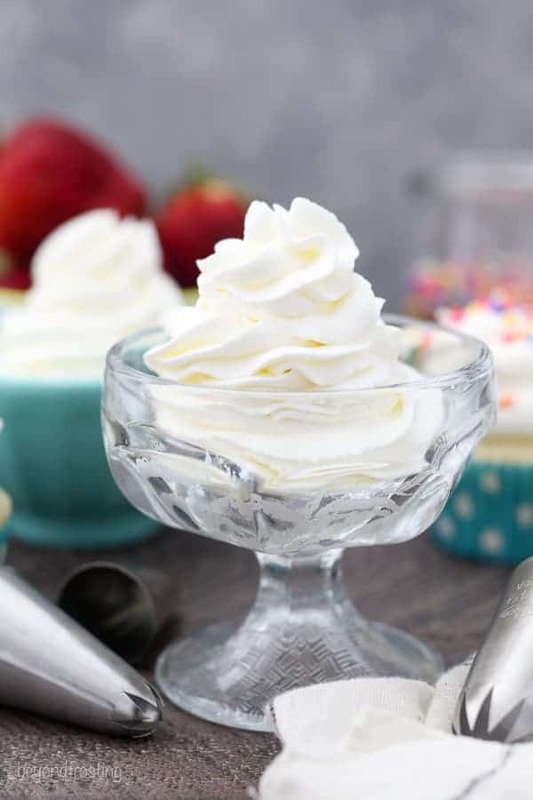 While I like to offer the option of using a pre-made whipped topping, such as Cool Whip, I always want to encourage readers to try making it yourself. It’s much easier than you think! 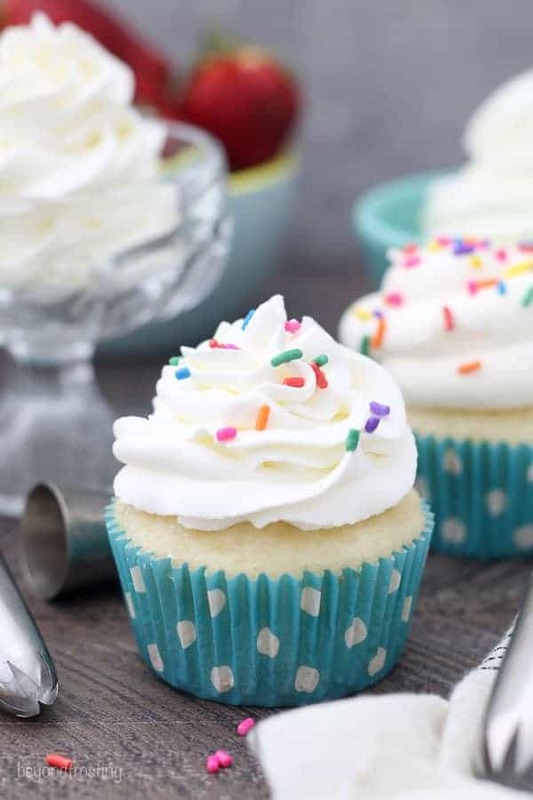 This recipe makes a nice and thick whipped cream which is perfect for piping and decorating cupcakes, cakes, pies and more. Best of all, this is a whipped cream without gelatin. 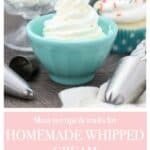 I love playing around with different flavors of whipped cream such as hot chocolate or cake batter whipped cream. Yum! Let me provide you with some helpful tips for how to make homemade whipped cream. 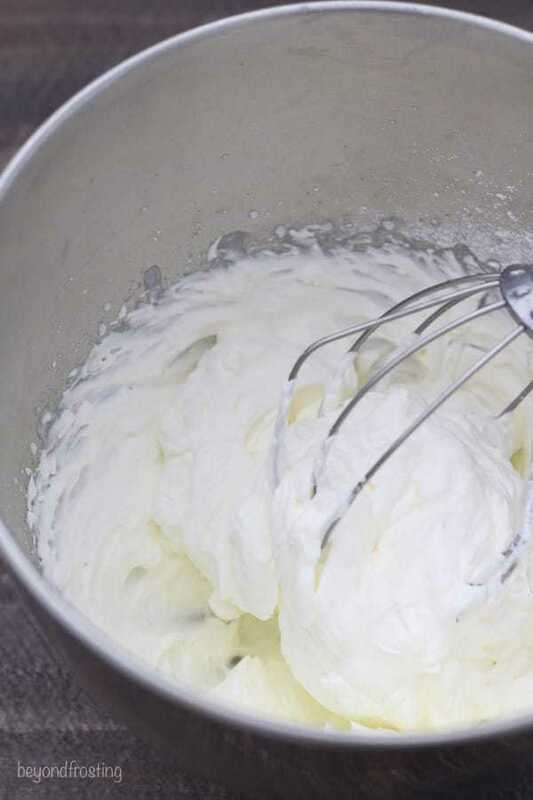 The key to a successful whipped cream involves a few simple steps. The most important part of making a stabilized whipped cream is adding something to help stiffen it up. I prefer not to use gelatin myself. My preferred stabilizer is powdered sugar. You will notice that I tend to use a lot of powdered sugar to make my whipped cream nice and stiff, which is perfect for piping! This does make the whipped cream a lot sweeter, but again, it’s a personal preference. You might also consider Mascarpone Whipped Cream for a more stabilized whipped cream. Start with cold ingredients and utensils. I always recommend placing your mixing bowl and your whisk in the freezer for 10 minutes or so to chill. It will help keep the cream nice and cold while it’s whipping. You’ll notice my video shows me making this in a glass bowl, but I prefer to use a metal mixing bowl because it gets colder than a glass bowl. Whipped cream needs to be whipped at a high speed. I always start on medium-high, which is speed 6-7 on my stand mixer. Once the whipped cream is bubbly and starts to thicken, add the powdered sugar slowly while reducing the mixing speed. Otherwise you’ll have quite a mess on your hands! Then, beat at a high speed until stiff peaks form. 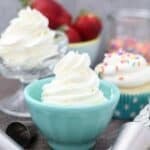 Can I make whipped cream without a stand mixer? Yes, you will notice that a majority of my recipe videos show me preparing whipped cream using a hand mixer. I find the hand mixer cannot achieve the same stiff peaks as a stand mixer, however it still does the job. 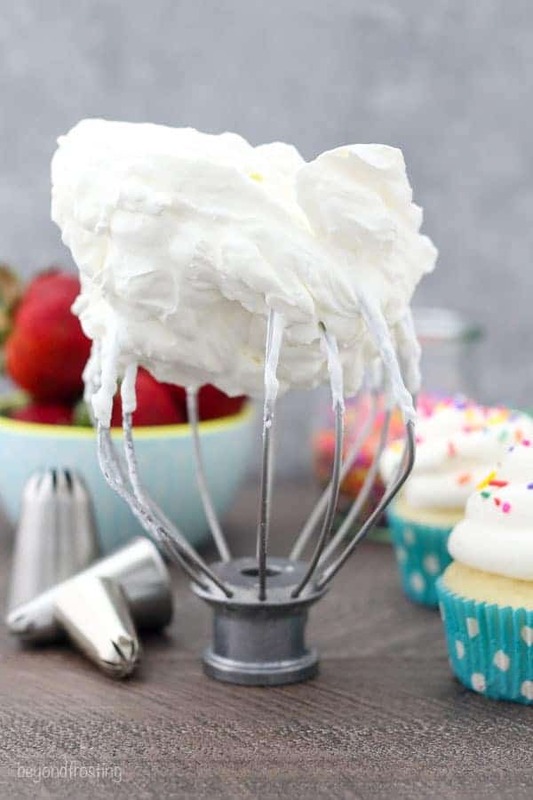 If you’re using a hand mixer, I suggest using your spatula to turn the whipped cream from the bottom to the top and continue mixing to ensure it’s evenly mixed. I’ve also heard whipped cream can be made in a stand or immersion blender, but I have never tried it myself. Are whipping cream and heavy cream the same? All my recipes use heavy whipping cream, as opposed to heavy cream. 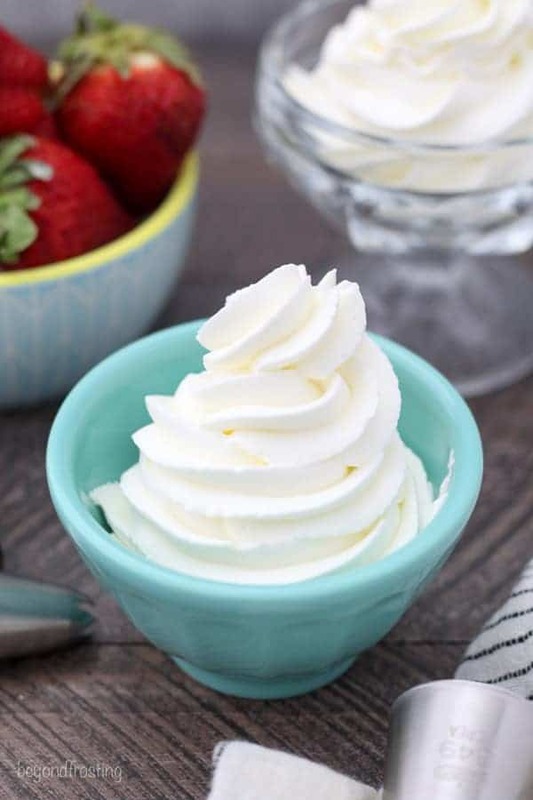 Whipping cream contains a higher fat content, which will hold a better shape and produce a thicker whipped cream. Technically you can use either, but I recommend heavy whipping cream if it’s available. Can I make whipped cream ahead of time? My opinion? Not so much. If I am making a no-bake dessert or pie, I always prefer to prepare the whipped cream just prior to serving or at least the same day that I am serving it. However, it can also be frozen if needed. I want the whipped cream to be fresh, and I find it’s more stable at this point. However, if you don’t have time and you need to make the whipped cream the night before serving, I suggest piping it onto your dessert at that time as opposed to leaving it in a bowl overnight. How do I flavor my whipped cream? Most recipes call for vanilla extract or vanilla bean paste. This is all well and good but consider substituting things like almond, mint or peppermint extract, lemon or lime zest, lemon extract, maple syrup, cinnamon or nutmeg. I have also been known to add some Bailey’s Irish Cream or bourbon to my whipped cream. Get creative! How much heavy cream do I need to make whipped cream? I never use less than ¾ cup (177 ml) of heavy whipping cream or more than 1 ¾ cups (414 ml) of heavy whipping cream at one time. This is because I find it can be more difficult for the whipped cream to form properly when using less or more than these amounts. Below is a table of helpful measurements that will ensure a nice, stiff whipped cream. This is a general guide, and, as always, there are exceptions to my rules. ¾ cup (177 ml) heavy whipping cream plus 1/4 cup (33 g) powdered sugar makes 7 ¼ ounces (205 g), or about 2 cups (150 g) prepared. 1 cup (237 ml) heavy whipping cream plus ½ cup (65 g) powdered sugar makes 10 ounces (284 g), or about 2 ¼ cups (168 g) prepared. 1 ¼ cups (296 ml) heavy whipping cream plus ½ cup and 2 tablespoons (114 g) powdered sugar makes 12 ounces (314 g), or about 2 ¾ cups (207 g) prepared. 1 ½ cups (355 ml) heavy whipping cream plus ¾ cup (98 g) powdered sugar makes 14 ounces (397 g), or about 3 ½ cups (263 g) prepared. 1 ¾ cups (414 ml) heavy whipping cream plus 1 cup (130 g) powdered sugar makes about 16 ounces (454 g), or about 4 cups (300 g) prepared. See below for my full recipe for how to make whipped cream. As alway, I’d love to hear from you! 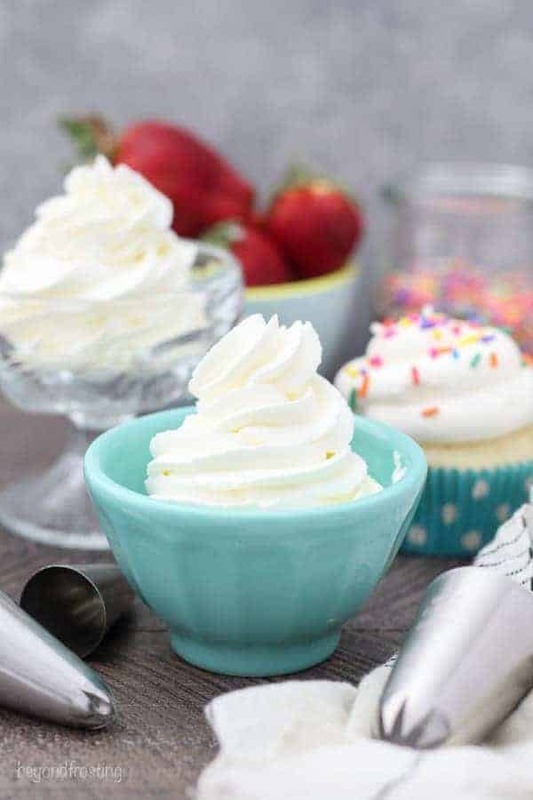 Do you have a favorite whipped cream recipe? Leave me a comment below. The recipe is for a sweetened, stabilized whipped cream without gelatin. It’s the perfect topping for cakes, cupcakes, pies, no-bake desserts and more. Prepare the whipped cream. Pour the heavy cream into the chilled bowl and use an electric or stand mixer to beat the heavy cream on medium-high speed until the cream starts to thicken. Slowly add the powdered sugar and continue beating on high speed until stiff peaks form. Whipped cream must stay refrigerate. 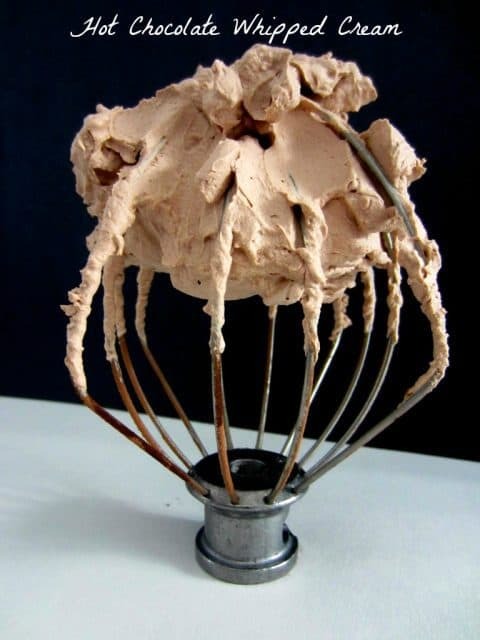 Hot or humid climates are no good for whipped cream. 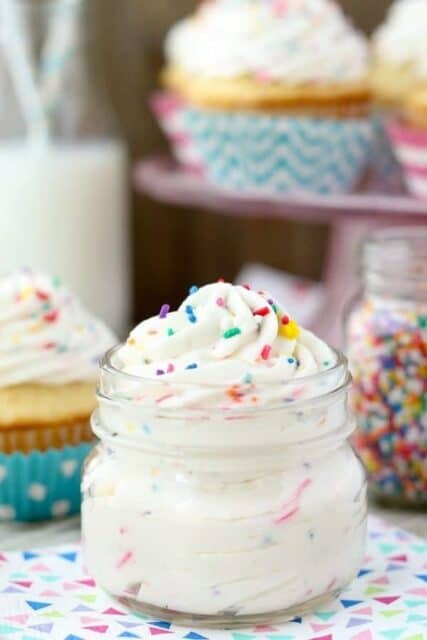 This is my all-time favorite frosting! Hi Kathleen, I have not made whipped cream with regular sugar myself. Absolutely Rose! I would use one or the other myself. Also fruit zests like lemon, lime and orange are also good. I would love to try this on my cakes as I am looking for a very light frosting for a dense cake. Can I ask once the cake is piped … I can leave the cake in the fridge for a week or so without the whipped cream weeping or not keeping it’s shape? Hi Cecelli, if you want to pipe and store it for a week, I would recommend using gelatin or a stabilized whipped cream such as mascarpone whipped cream. I don’t think I’d recommend keeping this for a week in the fridge, maybe in a freezer would be better but please note I have not done it myself.